“As I was training horses, I kept hearing, ‘You can’t train zebras, they’re untrainable.’ I said, ‘Why?’ To say something is untrainable implies that it can’t learn, and we all know that if they couldn’t learn, they’d all be extinct. They have to be able to learn and adapt. Obviously, the burden lies on the trainer to be able to train them,” Stohler said. I suppose the myth of the untrainable zebra has two bits of reasoning behind it. Firstly, that none of the locals in Africa bothered to domesticate zebras before Europeans arrived. Given that there were large parts of Eurasia in which other locals didn’t bother to domesticate horses before the Central Asian Steppes culture arrived in their midst, this argument doesn’t quite wash. The second question that arises: why don’t you see more Westerners riding around on them? I’d guess you don’t see more “tame” zebras because we already have plenty of specially bred, larger horses to choose from, and the striped equid represents mere novelty value. 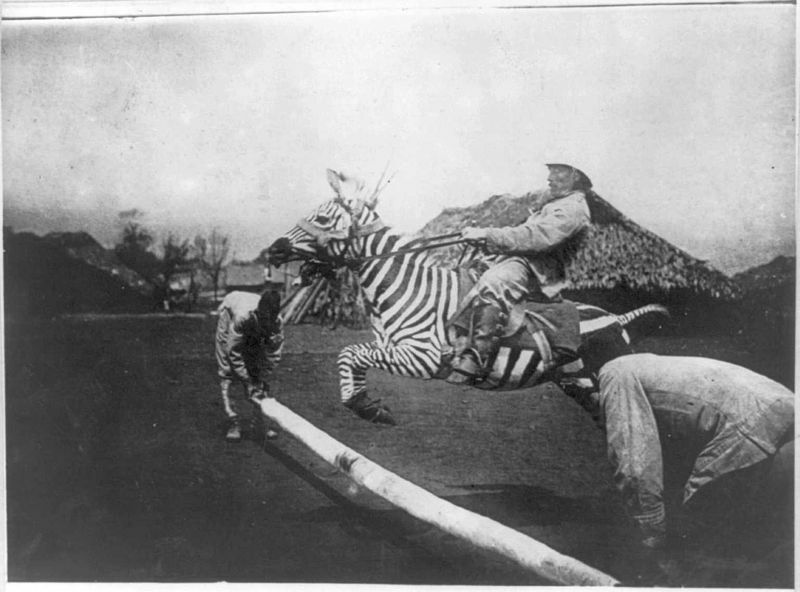 You could buy one from a specialist exotic animal dealer in London for between £100–£150 in Victorian Age (thank you to Lee Jackson for that snippet), and nowadays some zebra species are so common that you can actually expect to eat them as pizza topping in the UK. Yes, in topsy-turvy Britain it’s easier to buy zebra flesh than horse meat. 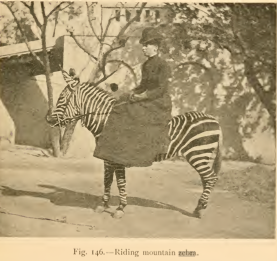 This entry was posted in 1800s, 1900s, Africa, Carriage Driving, Circuses, Driving, Equine Curiosities, Equine Slaughter, Horsemanship, Mrs Hayes, Sidesaddle, South Africa, Texas, USA, Zebras and tagged carriage driving, Circus Knie, Sammi Jo Stohler, Sidesaddle, Walter Rothschild, zebra meat, zebras. Bookmark the permalink. You don’t see more tame zebras because they have highly developed fight-or-flight instincts and are very different to work with than calm, tolerant horses and donkeys. They bite, they kick, they are strong and run fast. A zebra highly socialized to humans and trained well from foalhood can sometimes be trained by a patient person to ride or drive. They tend to be small pony sized, but never could you trust a zebra with children the way you might a donkey or a pony, and only rarely would a zebra become a moderately reliable mount for an adult on a trail ride, much less a bustling horse show. Notice that the driving team of zebras has a pony on the nearside in the lead pair, this is for steering and safety because the pony is more steady–and even then they probably are not taking this team on busy city streets. Half-zebra hybrids (ie zorses) are OCCASIONAL horse show entrants in some simple class, but I have never heard of a zebra being able to do so. If zebras often made good riding and work animals, they would be used in that way in their homeland, but they are not good for that, donkeys and ponies are. Zebras have a lot of potential to be dangerous to people. Unless some very motivated person manages to selectively breed calmer zebras, zebras under saddle or in harness will remain a rare novelty. The liberty act zebra video is pretty fun! They look like they are having a good time. 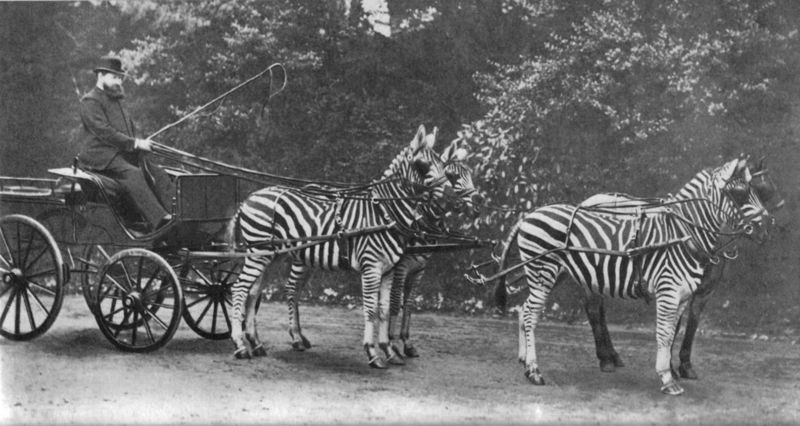 The Rothschilds took their zebra driving team into Central London in the nineteenth century, but I’m not sure how often that happened. And Mrs Hayes was clear that a zebra was not a lady’s mount and not for the hunting field. Zebras are perhaps more sensible than horses :) I always marvel at the enormous trust horses place in us, often wrongly!